Spidey’s gone home and he’s back where he belongs. In the Big Apple, bringing its lowlifes and thugs to justice and keeping its supervillain community in check. 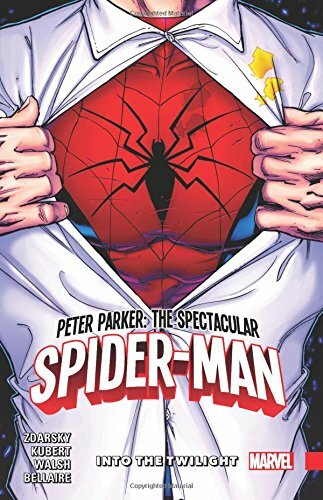 The city that’s so good they had to name it twice, along with the genetically altered material from a radioactive spider bite, is in his blood and while jetting around the world as the CEO of multi-national corporation was everything he’d ever dreamed of, at some point, Pete was always going to go back to what he knew best. Swinging between the skyscrapers in the place he knows best. Admittedly, the whole Secret Empire thing probably sped it up and sent him back to New York a couple of decades before he was ready to return, but for the legions of wall-crawling fanatics the world over, sooner is better than later. After a rather shaky start in which he tries to find his feet in a slightly embarrassing and painful run in with the Vulture on his old beat and before he can say “Curse the Parker luck”, things start to settle down and get back to as normal as they ever get for the Spectacular Spider-Man. Which means, of course, that his personal life is motoring to hell in rocket powered handcart, J Jonah Jameson is still gunning for him and through no fault of his own, he’s caught in a web* of SHIELD centric treachery, deceit and double dealing, as a rogue faction from within Nick Fury’s pride and joy stretches it’s claws and starts to make its presence felt. All of which would be more than enough for your average masked crusader to deal with on any given day, but Spidey’s far from being a run of the mill hero. No, that day to day stuff, that’s just the tip of the iceberg for the Wallcrawler and in Into the Twilight as he also finds himself dealing with some serious family issues, bumping heads with the Kingpin, forging a loose sort of alliance with Ironheart and discovering a whole new world of superhero technology thanks to the brother of an old enemy. Then there’s Jonah. Okay, so there’s never been a time when Jonah hasn’t been a thorn in Spidey’s side, but the Pete and Jameson encounter that dominates the closing moments of Into the Twilight, and what it means for their future relationship, well I never saw that coming. Not in a whole bunch** of a month of Sundays. ** Is there a collective term for a month of Sundays? I don’t know. Do you? Do you care? Nope, didn’t think so.